But in keeping with advances in mobile phone technology that feed the need to be constantly in touch, even while driving, along with a growing concern among citizens, police have started recording whether texting played a role in accidents. Quebec’s auto insurance board is expected to release results for 2011 early in the next year. And the Canadian Automobile Association is opening a contest for students to create the best short video detailing the hazards of the practice. In a recent survey by the CAA, 98 per cent of respondents said they found the practice of texting or emailing while driving either a serious or somewhat serious threat, slightly higher than the percentage that said having a few drinks before getting behind the wheel posed a threat. The number of driving deaths attributed to drinking has dropped thanks to years of education campaigns, St-Pierre said, although alcohol, along with speed, remained the top causes of the 487 fatal traffic accidents in Quebec in 2010. Now it’s time for the dangers of texting while driving to be emphasized in driver training courses, and for laws to be strictly enforced, St-Pierre said. The dangers have been well documented elsewhere. 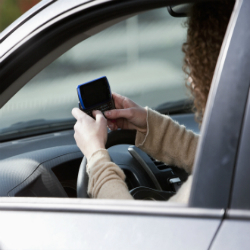 One study by a Texas university found that 16,000 people were killed as a result of texting while driving in the United States between 2001 and 2007. Another study out of England noted that texting among 17 to 24 year olds increased drivers’ reaction time by 35 per cent. Drivers who were at the legal limit for alcohol consumption of 0.08 showed an increase in reaction time of 12 per cent. A driver moving at 50 kilometres per hour who spends four seconds sending a text will cover 56 metres, the equivalent of half a soccer field, with his eyes off the road, the CAA notes. The fine for holding a mobile telephone device in one’s hand in the car to text, talk, email or even just check the time is $115 with administration charges added in, along with three demerit points, said Gino Desrosiers of the Société de l’assurance automobile du Québec. The penalty applies even if you’re stopped at a light or stuck in a traffic jam. There is no fine for pulling over, parking the car and using the phone.